About Deeside Classic Campers – We are based in beautiful Royal Deeside, Aberdeenshire, Scotland on the edge of The Cairngorms National Park. Hi, we are Claire and Martin Page who run our family business of Deeside Classic Campers. We have a passion for classic VW campers and bringing our customers unique Camper holiday experiences. …the perfect place for you to start your adventure. With a background as a PA in the demanding medical profession, Claire dedicates her time to the busy day to day running of Deeside Classic Campers and thoroughly enjoys providing advice and chatting to camper customers, as well as excited brides and grooms! Claire loves greeting holiday camper adventurers when they come to collect and return their camper from their VW experience! 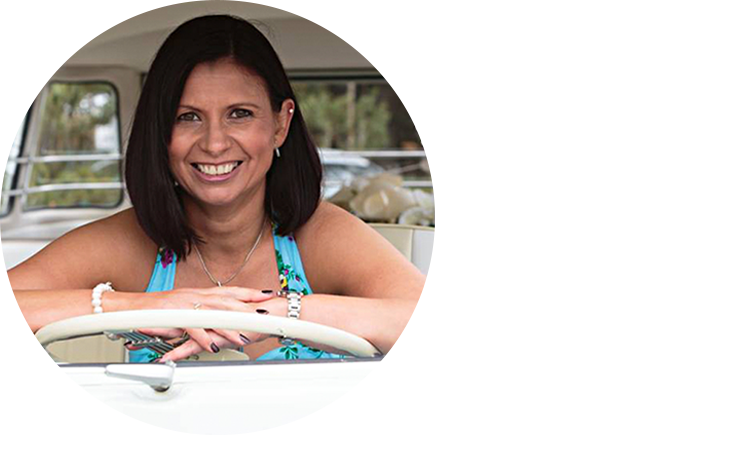 She finds the managing of chauffeurs and the planning of wedding logistics for the campers to attend weddings all over Scotland to be a very rewarding part of the business. In summary, she loves to chat! Having spent 30 years in the Police undertaking a variety of demanding roles, Martin retired in October 2016. At the age of 49 years this pensioner now manages our VW fleet. This includes refurbishing, cleaning, and servicing the campers throughout the year, enabling us to present our VW boys in show condition for every client. His other passion is rallying his BMW Mini Cooper S. This is unfortunately rubbing off on our daughters! Emily is a very keen co-driver and Martha from the age of 3 years is now very familiar with her bag of spanners! 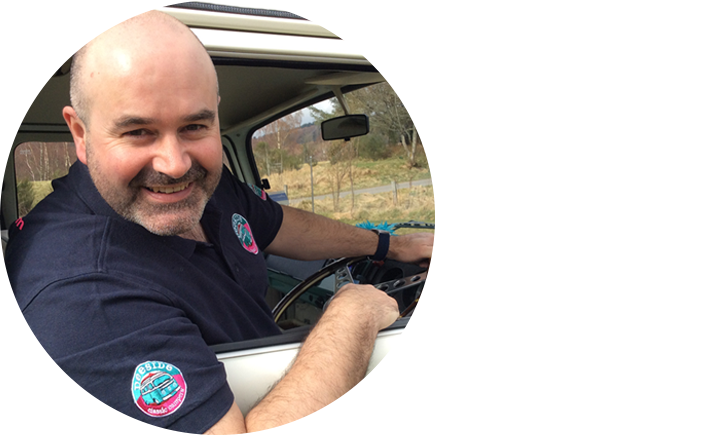 We launched our classic VW camper business with Hamish VW in March 2014 at the Scottish Great Outdoor Exhibition. Hamish VW set off on his first adventure in April 2014. It became quickly apparent we needed a second camper! Fergus VW joined our family in June 2014. Angus VW wedding bus joined us the following January to launch our wedding chauffeur service, at the AECC’s Your Wedding Exhibition. Our fantastic suppliers VW Downunder and Madmatz VW Interiors had just 6 weeks to complete the restoration on Angus VW! He was delivered to us three days prior to the Exhibition! 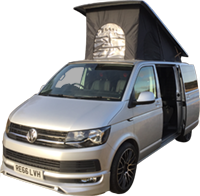 In early 2016 we complemented our classic VW boys with a brand new modern VW T6, Murdo. In 2017 we added a second wedding bus, Archie, as the demand for our wedding chauffeur service continued to grow. 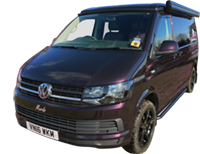 We pride ourselves on our helpful, friendly customer service, and our attention to quality and detail is reflected in this as well as our campervans. We are only too happy to talk you thourgh any questions or queries you may have, so please feel free to pick up the phone and give us a call. We have a wealth of experience and knowledge of camping and exploring Scotland. We are able to provide you with our expertise of routes, best campsites, camping tips, places to visit, including distilleries, castles, best places to climb, cycle, ski, and other daring dos! We are also members of the Camping & Caravanning Club and as such we pass on our campsite fee discounts on to you the customer, every little helps! So what are you waiting for, it’s time to start your adventure!